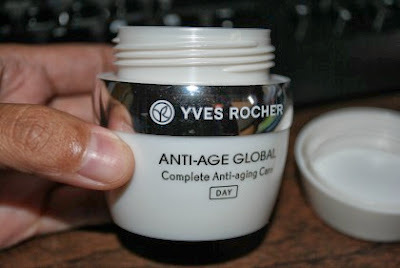 Anti-Age Global is another product line from Yves Rocher that I got to try. This Anti-Age Global Complete Anti-aging Day Care claims to protect, smooth wrinkles and regenerate the skin's appearance. This anti-aging skincare product helps reduce the signs of aging because of the 4G Plant Source Cells from Echinacea. You can buy a 50 ml jar online for $35. This is the time of year is when I am most into skin moisturizers because my skin gets really dry and sometimes flaky. I don't normally have dry skin but the winter season here in northern Minnesota can really be hard on it. I tried this cream for a few days and it really helped to moisten my face. It is a day cream but unfortunately, it doesn't have SPF added to it. That is the downside but I like this product overall because it is not oily and it absorbs fast. It leaves my skin smooth, silky and hydrated. Wrinkle wise, I could not tell because I am still in my early thirties and don't really have the need for an anti-aging cream yet. The slight cooling effect feels great on my face. It doesn't leave a residual shine but instead, a healthy glow. I like the fragrance, not overpowering. ﻿This Anti-Age Global Complete Anti-aging Eye Care claims to provide moisture, smooth wrinkles and fine lines under eye bags and fades dark circles. The 15 ml jar is available online for $26. Part of the efficiency of this product comes from its application. The curved metal tip with a hole in it provides users a very easy application. I use it when rubbing the cream under my eyes instead of my finger. I just need to put enough cream on the applicator so I don't drag and pull my skin too much. The curved metal tip is perfect for gliding along the socket bone. Since the metal is cold, it helps get rid of your eye puffiness. 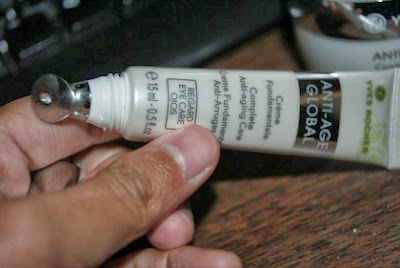 I use this eye cream during the day. Like the day cream, it also absorbs fast. There's a bit of fragrance to this eye cream, almost similar to the day cream but it is much less. I will definitely keep using this product because I really like it.